A new trio of space station crew members arrived at the Baikonur Cosmodrome on Friday to complete mission preparations. In space, the orbital residents began a series of Cubesat deployments. The Expedition 44/45 crew comprised of Soyuz Commander Oleg Kononenko and Flight Engineers Kjell Lindgren and Kimiya Yui are wrapping up preflight training in Kazakhstan. 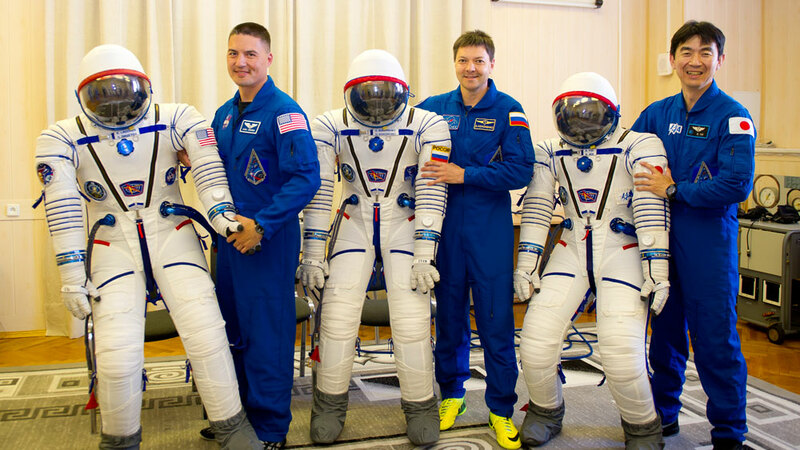 They will launch July 22 aboard the Soyuz TMA-17M spacecraft for a six-hour ride to the International Space Station. On board the International Space Station, One-Year crew member Scott Kelly set up the Japanese Kibo airlock for Cubesat deployments this week. Kelly also explored fluid physics for the Capillary Beverage study. Cosmonauts Gennady Padalka and Mikhail Kornienko studied liquid crystals and observed chemical reactions in the Earth’s upper atmosphere. In the future,mankind break through the wall of universe. And the day may come that the appearence of universe is clarified from outer universe. O universo é imenso demais… Ainda estamos iniciando um futuro promissor. Que Deus sempre guie os passos dos homens e mulheres do espaço. Wow, it’s really inspiring, these guys looks like ordinal people, they doesn’t seem strong, but, IN FACT, they’re the smartest, strongest and have an incredible adaptation ability from all candidates, and they finished an incredibly tough NASA training program. God estaja always present the heroes of NASA.